Be the first to share your favorite memory, photo or story of Bernita "BOO" . This memorial page is dedicated for family, friends and future generations to celebrate the life of their loved one. 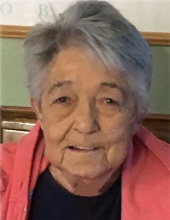 Bernita, 80, of Golden, Colorado, passed away March 19, 2019. She was preceded in death by her husband, Bill, and her son, Mark. She is survived by three of her children, Kathy Wyant, Debbie (Tim) Hiett, Bill (Tanya) Petry, eight grandchildren, and one great-grandchild, all of whom who will miss her dearly. Those who loved "Aunt Boo" are too numerous to mention--she truly loved each and every one of them. Born in Boulder, Colorado to George and Dorothy Hogan, Bernita graduated from Golden Sr. High School. Shortly thereafter, she completed her LPN Certification thru St. Anthony Hospital. On March 19, 1958 Bernita and Bill were married in Golden, Colorado. She passed away on their 61st Wedding Anniversary. Bernita was a homemaker, a loving mother, grandmother, aunt, and friend. She had a great sense of humor, and will likely be remembered by those who knew and loved her as a woman who was fiercely loyal to her family and friends. Bernita was an accomplished seamstress, loved the outdoors, especially camping, fishing, watching NASCAR or simply sitting on her front porch with friends and a cold beverage. Bernita was a lifelong member of St. Joseph Catholic Church in Golden, where her Recitation of Rosary services will be held at 9:30 a.m., on Saturday, April 27th, St. Joseph Catholic Church, 969 Ulysses St., Golden, followed by a Funeral Mass at 10:00 a.m., Graveside service will follow Mass, where she will be laid to rest at Golden Cemetery with her husband Bill and son Mark. To send flowers or a remembrance gift to the family of Bernita "BOO" Marie Petry, please visit our Tribute Store. Guaranteed delivery before Bernita "Boo" 's recitation of the rosary begins. Guaranteed delivery before Bernita "Boo" 's funeral mass begins. "Email Address" would like to share the life celebration of Bernita "BOO" Marie Petry. Click on the "link" to go to share a favorite memory or leave a condolence message for the family.